“Schools across Texas continue to deal with overcrowding. 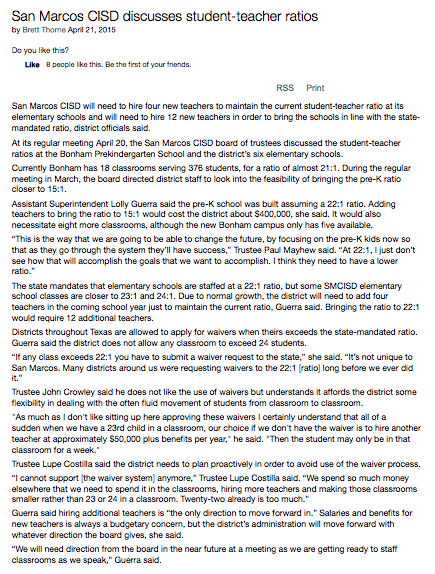 The San Marcos CISD school board has been split on the best way to manage it in their district. “While Texas schools mandate a maximum 22 students in kindergarten through 4th grade classrooms, schools often request waivers to go over that limit. Seven people are running for two at-large positions on the San Marcos school board, the district’s most crowded race in recent years. The candidates with the most votes will win the spots. For the next three years, they will help oversee one of the fastest-growing districts in Central Texas. Over the past decade, the district has grown about 9 percent, to 7,755 students. Anne Halsey, 41, said that when she moved to San Marcos in 2010, people told her to put her children in private school instead of the district. She didn’t listen, and now her fourth-grader is learning computer coding and robotics and taking modern dance classes at school. Halsey said the district needs to do more to spread the word about all the good things that are happening and dispel perceptions that it is a bad district. Halsey, who worked on marketing campaigns for cable networks before becoming a stay-at-home mom, wants to expand the district’s pre-kindergarten program to all students as quickly as possible. The program is restricted to students who are low-income, can’t speak English or have other challenges. Voters in San Marcos CISD will choose among Sophia Downing, Adam Gonzalez, Anne Halsey, Toby Hooper, John McGlothlin, and Mike Occhialini for two at-large positions on the board of trustees in the district’s May 9 election. Get to know the candidates more here.